Yeah, did some reading and the + has all the features of the regular MX + a few more. The most notable prob being that it allows iOS devices to be used, so Apple compatible. I know this is rather old, but did anything get figured out with this? After doing my last proxy alignment, I got MIL on for no crank sensor learned. I ran the diagnostic "test" of timing sensor and/or cam replacement. All that did was make the check engine light flash several times, but the light is still on. I've tried clearing all codes, doing another proxy alignment, ect all to no avail. Is there something I'm missing?? Did you replace anything before getting the code? It wants a relearn. Select Dodge/Ram. Select engine. Select control unit Marelli 1.4 MultiAir. Go to the Fiat open hood icon. Under procedure to perform, select Timing sensor and/or cam replacement and start. That should do the relearn. The Crankshaft Position System learn feature is used to calculate reference errors caused by slight tolerance variations in the crankshaft, target wheel and the crankshaft position sensors. The calculated error allows the Powertrain Control Module (PCM) to accurately compensate for reference variations. The Crankshaft Position System variation compensating values are learned and stored in the PCM memory during a decel fuel shutoff event. If the CKP System variation values are not learned and stored in the PCM memory, DTC P0315 sets. If the actual crankshaft variation is not within the CKP systems window stored in the PCM, DTC P1300 sets and the values are not learned. •This diagnostic runs continuously with the ignition on. •The CKP system variation values are not stored in the PCM memory. The Clear Misfire TLC Miscellaneous Function must be performed using the scan tool anytime there has been a repair/replacement made to a powertrain system, for example: flywheel, valvetrain, camshaft and/or crankshaft sensors or related components. 2. With the scan tool, select PCM/Misc. Functions/Clear Misfire TLC and follow the on screen instructions. If a negative response is displayed after the Clear Misfire TLC procedure is performed, start the engine and perform the Clear Misfire TLC procedure over until the misfire monitor is cleared. 3. Start the engine and allow the coolant temperature to increase above 60°C (140°F). 4. With the scan tool, select Monitors / OBD II Monitors / Misfire Monitor Screen, and observe the Misfire Monitor Status. 5. Perform a 6000 rpm WOT stab and let the engine return to idle. The status should change from waiting to in progress, verifying that the misfire monitor is active and the learn procedure is complete. Did the PCM complete the TLC Relearn procedure? •Start the process over until the Relearn procedure is completed. 2. Turn the ignition on, engine not running. 3. With the scan tool, erase all DTCs. 4. Start the engine and allow it to idle. 5. With the scan tool, read DTCs and record on the repair order. Is the DTC active or pending? 2. Visually inspect the CKP wire harness. Look for any chafed, pierced, pinched, or partially broken wires. 3. Visually inspect the CKP wire harness connectors. Look for broken, bent, pushed out, or corroded terminals. 4. Verify that there is good pin to terminal contact in the Crank Position Sensor and Powertrain Control Module connectors. 5. Ensure that the Crankshaft Position Sensor is properly installed and the mounting bolts are torqued to the proper specification. •Perform the POWERTRAIN VERIFICATION TEST. (Refer to 28 - DTC-Based Diagnostics/MODULE, Powertrain Control (PCM) - Standard Procedure). 1. Remove the Crankshaft Position Sensor. (Refer to 14 - Fuel System/Fuel Injection/SENSOR, Crankshaft Position - Removal) . 2. Inspect the Tone Wheel/Flex Plate for damage, foreign material, or excessive movement. •Repair or replace the Tone Wheel/Vibration Damper as necessary. (Refer to 09 - Engine/Engine Block/DAMPER, Vibration/Removal) . If there are no possible causes remaining, view repair. •Replace the Crankshaft Position Sensor. (Refer to 14 - Fuel System/Fuel Injection/SENSOR, Crankshaft Position - Removal) . That means the software part is not the problem. Verify the wiring to the crank sensor and cam sensor using a multimeter, check the tone wheel, and if those all check out, replace the crank sensor. I have been having a flashing odometer for the last couple months. Was hoping it would go away on its own but it does not seem to want to. It is code U0140-00 - LOST COMMUNICATION WITH BODY CONTROL MODULE (BCM). I have heard I need to do a proxi alignment, which is what the flashing odometer means, but have a few questions redarding it. Will a proxi alignment work with that code, as it is related to my BCM? Will the OBDLink MX+ work with AlfaOBD and to do a Proxi Alignment? I am just seeing on Amazon it is only $10 more than the MX, and if it can access a little more for just the slight rice difference, I would rather get that. Also, are the only things I need to purchase are the AlfaOBD app, and the Bluetooth OBDLink MX(+?)? I have been reading about adapters but am not sure if I need them? The PROXI should still work. Usually that code is intermittent and the PROXI might even get rid of it. Get the OBDLinkMX directly from the manufacturer as that is usually the lowest cost. The main advantage of the MX+ is that it will work with an I-phone but the alfaOBD app is only android or PC so you really don't need the MX+. You do not need any adapters. The PC version of alfaOBD is a little more complicated so if you have an android device, that is easier. I prefer an android phone over a tablet. You really don't need a bigger screen. Android devices update automatically through Playstore and the PC laptop version must be updated manually. Out of curiosity, I looked up U0140. One of the possible causes is a BCM not configured correctly. NOTE: For an in-depth explanation of the CAN system operation, refer to the DESCRIPTION in Section 8E, COMMUNICATION. 1. Check Battery for proper State of Charge (SOC) and Charging System for proper operation. (Refer to 08 - Electrical/Charging/Diagnosis and Testing) . 2. With a scan tool, check all electronic Control Modules for battery and ignition voltage related DTCs. 3. Check for and perform all Service Bulletins that could be related to the customer complaint. 5. With a scan tool, check all electronic Control Modules for software updates that are related to the customer complaint. Update Control Module(s) as necessary. 6. Check wire harnesses for collision related damage. •Repair the problem as necessary. •With a scan tool, erase DTCs from the related electronic Control Modules and perform the appropriate VERIFICATION TEST. If a VERIFICATION TEST is not available for that module, perform the BCM VERIFICATION TEST. (Refer to 28 - DTC-Based Diagnostics/MODULE, Body Control (BCM) /Standard Procedure). A Configuration DTC indicates that an Electronic Control Module (ECU) is not programmed with information that is specific to the vehicle (VIN, mileage, etc.). If an ECU is not configured properly, serial data communication failures could exist. The following list includes, but is not limited to, DTC descriptors that indicate a Configuration DTC. 1. With the scan tool, generate a Vehicle Scan Report. 2. With the Vehicle Scan Report, check all ECUs for Configuration DTCs. Are any Configuration DTCs set? •Configure the ECU(s) as necessary in accordance with the Service Information. •Perform the appropriate VERIFICATION TEST. If a VERIFICATION TEST is not available for that electronic Control Module, perform the BCM VERIFICATION TEST. (Refer to 28 - DTC-Based Diagnostics/MODULE, Body Control (BCM) /Standard Procedure). 1. Refer to the Vehicle Scan Report. Are any Communication related DTCs active? Refer to the Vehicle Scan Report. NOTE: Diagnose Lost Communication DTCs (not to be confused with CAN Bus Off or Can Bus Performance DTCs) before diagnosing other CAN related DTCs. Which type of Communication DTC is active? NOTE: Diagnose all Lost Communication DTCs before diagnosing other CAN related DTCs. Which type of Communication DTC is stored? •Perform the STORED LOST COMMUNICATION DTCS procedure. (Refer to 29 - Non-DTC Diagnostics/Communication/Diagnosis and Testing) . NOTE: The ‘Offending Control Module’ is the module that the Implausible DTC is set against. Are any DTCs set in the Offending Control Module? •Refer to the appropriate diagnostic procedure. One module is reporting a Lost Communication DTC against a single Control Module. Multiple Control Modules are reporting a Lost Communication DTC against a single Control Module. •Perform the NO RESPONSE diagnostic procedure for the Control Module that is not communicating. (Refer to 29 - Non-DTC Diagnostics/Communication/Diagnosis and Testing) . NOTE: The ‘Offending Control Module’ is the module that the Loss of Communication DTC is set against. Is the Offending Control Module active on the bus? •Replace the Reporting Control Module in accordance with the Service Information. •Perform the appropriate VERIFICATION TEST. If a VERIFICATION TEST is not available for that Control Module, perform the BCM VERIFICATION TEST. (Refer to 28 - DTC-Based Diagnostics/MODULE, Body Control (BCM) /Standard Procedure). •Perform the NO RESPONSE diagnostic procedure for the module that is not communicating. (Refer to 29 - Non-DTC Diagnostics/Communication/Diagnosis and Testing) . NOTE: The ‘Offending Control Module’ is the module that the Implausible Data, Implausible Signal, Missing Message, or Invalid Data DTC is set against. With the scan tool, check the Offending Control Module for non-U-code DTCs that are related to the U-code that is set, or related to the customer complaint if the U-code DTC name is not clear about which signal is faulted. NOTE: IMPORTANT: Some Control Modules simply pass information from one Control Module to the other. In some cases, a U-code DTC may be set that implicates the “pass-through” module that sent the information. For example, if an Engine Coolant Temperature (ECT) Sensor DTC is set in the Powertrain Control Module (PCM), the HVAC module may set an “Implausible Data from BCM” DTC because the BCM is the module that normally passes that information from the PCM to the HVAC module. However, the BCM may not set any DTCs related to the faulted ECT Sensor because the BCM does not use the ECT information. In this case, the PCM ECT DTC should be diagnosed before the Implausible Data DTC. If you suspect a scenario like this, diagnose the non U-code DTC(s) before diagnosing any Implausible Data, Implausible Signal, Invalid Data, or Missing Message DTCs. 1. With the scan tool, check all other Control Modules for non-U-code DTCs that are related to the U-code that is set, or related to the customer complaint if the U-code DTC name is not clear about which signal is faulted. Is a related non U-code DTC set in another Control Module? •Diagnose the related DTC. Refer to the appropriate Diagnostic Procedure. •Replace the Offending Control Module in accordance with the Service Information. •Perform the appropriate VERIFICATION TEST. If a VERIFICATION TEST is not available for that module, perform the BCM VERIFICATION TEST. (Refer to 28 - DTC-Based Diagnostics/MODULE, Body Control (BCM) /Standard Procedure). 1. Disconnect all related wire harness connectors. 2. Disconnect all related in-line wire harness connections (if equipped). •Weather seal damage (if equipped). •Overheating due to a poor connection (terminal may be discolored due to excessive current draw). •Terminals that have been pushed back into the connector cavity. •Perform a terminal drag test on each connector terminal to verify proper terminal tension. Repair any conditions that are found. 4. Reconnect all related wire harness connectors. Be certain that all wire harness connectors are fully seated and the connector locks are fully engaged. 5. Reconnect all in-line wire harness connectors (if equipped). Be certain that all connectors are fully seated and the connector locks are fully engaged. 6. With the scan tool, erase DTCs. 7. Using the Vehicle Scan Report, operate the vehicle in the conditions that set the DTC. 8. With the scan tool, read DTCs. •If there is a history of this DTC setting multiple times, replace the Offending Control Module in accordance with the Service Information. Continuously when the ignition is on. The battery voltage between 10 and 16 Volts. Body Control Module (BCM) is configured correctly. Bus messages not received from the Body Control Module (BCM) for approximately two to five seconds. NOTE: Make sure the battery is fully charged before proceeding. 2. With the scan tool, read the active DTCs. Does the scan tool display: U0140-LOST COMMUNICATION WITH BODY CONTROL MODULE? •(Refer to 29 - Non-DTC Diagnostics/Communication - Diagnosis and Testing) and perform the NO RESPONSE FROM BCM (BODY CONTROL MODULE) diagnostic procedure. •(Refer to 29 - Non-DTC Diagnostics/Communication - Diagnosis and Testing) and perform the Stored Lost Communication DTCs diagnostic procedure. NOTE: If the scan tool is unable to identify the vehicle, a CAN C bus concern may be present. (Refer to 29 - Non-DTC Diagnostics/Communication - Diagnosis and Testing) and perform the CAN C BUS NO RESPONSE diagnostic procedure. NOTE: Check for any TSB(s) related to the condition. If a TSB applies, perform the procedure outlined in the TSB before continuing. NOTE: Make sure the battery voltage is between 10.0 and 16.0 volts. 2. With the scan tool, read the module status. NOTE: Check the BCM for any active CAN hardware DTCs, perform DTC before proceeding. Does the scan tool indicate that the module is active on the bus? •The no response condition is not present at this time. Using the wiring diagram/schematic as a guide, inspect the wiring for chafed, pierced, pinched, and partially broken wires and the wiring harness connectors for broken, bent, pushed out, and corroded terminals. •Perform the BODY VERIFICATION TEST. (Refer to 28 - DTC-Based Diagnostics/MODULE, Body Control (BCM) - Standard Procedure). 2. 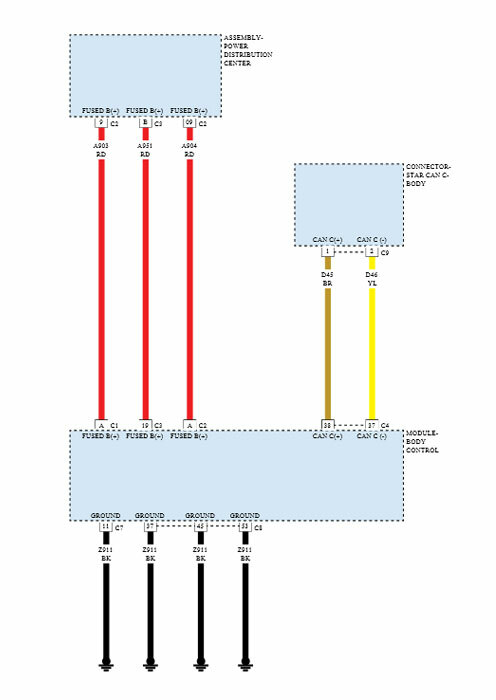 Using the wiring diagrams as a guide, disconnect the appropriate BCM harness connectors that house the Fused B(+) circuits. 3. Using a 12-volt test light connected to ground, check each Fused B(+) circuit. Does the test light illuminate brightly for each circuit? •Repair the open or short in the applicable Fused B(+) circuit. 1. Using a 12-volt test light connected to 12-volts, check the (Z914) Ground circuits. •Repair the open in the (Z914) Ground circuit(s). 2. Disconnect the CAN C Body C8 Star Connector. 3. Measure the resistance of the (D45) CAN C Bus (+) circuit between the CAN C Body C8 Star Connector and the BCM C4 harness connector. 4. Measure the resistance of the (D46) CAN C Bus (-) circuit between the CAN C Body C8 Star Connector and the BCM C4 harness connector. Are the resistances below 5.0 Ohms? •Replace the BCM in accordance with the Service Information. (Refer to 08 - Electrical/8E - Electronic Control Modules/MODULE, Body Control - Removal) . •Repair the open in the (D45) CAN C Bus (+) or (D46) CAN C Bus (-) circuit. With the ignition on for at least five seconds. Bus messages not received for approximately two to five seconds. NOTE: Stored faults may indicate a customer perceived intermittent condition. NOTE: Make sure the battery voltage is between 10 and 16 volts before proceeding. 2. With the scan tool, read stored DTCs. •Go to and perform the appropriate diagnostic procedure. 1. With the scan tool, read the loss of communication environmental data. Does the loss of communication environmental odometer data match up to any of the previous service procedures listed in the possible causes or are there any stored CAN C hardware electrical, battery, ignition voltage, VIN missing/mismatch, or BCM configuration DTCs present with matching environmental data? •These DTCs may have been the result of other service procedures performed. Clear the DTCs. 1. With the scan tool, read all DTCs. Is there more than one ECU with stored DTCs “Logged Against” the module and one or more lost communication DTCs stored in the offending module? •Verify if the vehicle was recently in for this type of service. Otherwise, visually inspect the related wiring harness for chafed, pierced, pinched, and partially broken wires and the wiring harness connectors for broken, bent, pushed out, and corroded terminals. Repair as necessary. Is there more than one ECU with stored DTCs “Logged Against” the module and NO lost communication DTCs stored in the offending module? •Check for a TSB related to this offending module. Is there ONLY ONE ECU with stored DTCs “Logged Against” the module? •Check for a TSB related to the module that set this DTC. Last edited by alpinegreenneon; 03-04-2019 at 11:33 AM. I have my Galaxy Note 9, so sounds like I should be good in that department! Thank you so much, and looks like I will just be picking up the MX in hopes I can get everything back to normal.